Aptika, a trusted leader in ID solutions, introduces its LuggageTag in the Cloud platform (https://www.luggagetag.cloud/), opening a brand-new world of secure and confidential luggage identification. Billions of pieces of luggage move around the globe every year. If a piece gets lost, LuggageTag in the Cloud helps the owner get it back as quickly as possible. With the help of our durable and colorful luggage tag, an individual or airport personnel can contact the owner easily and confidentially anywhere in the world. "LuggageTag in the Cloud lays the foundation of a new revolution in lost luggage recovery." said Martin Bourdages, Business Development Director of Aptika. "SITA WorldTracer® reveals that 5.57 bags per 1,000 passengers were mishandled last year. The total number of mishandled bags was an incredible 22.7 million." With LuggageTag in the Cloud, Aptika helps travelers get their luggage back safely and in a confidential manner. "No more need to hurriedly fill out a paper airline luggage tag on the corner of a desk and disclose personal information on the bag." added Martin. "Among other things, that's a way of saying to prying eyes that the house is empty!" So, travelers can relax and enjoy their journey, knowing that their luggage is clearly identified. Firstly, tags must be ordered via our online platform, by choosing among a selection of unique designs. A tag with a unique code assigned can be ordered for each piece of luggage. Each tag includes a clear vinyl loop to secure it to your luggage. After Quality Assurance inspection, the tags are shipped anywhere in the world with free delivery. Above all, our service is covered by a lifetime protection by our system. Secondly, attached securely to the bag in question, if it should go astray the QR code on the tag can be scanned, or the unique code entered on our website, by the person who found it. Our automated platform will inform the owner in real time (24 hours a day, 7 days a week) anywhere in the world via SMS and email, as soon as reported. Thirdly, the owner can contact the person who found it directly and get it returned as quickly as possible. Finally, and most importantly, luggage lost by an airline is returned to the owner free of charge. Luggage Tag in the Cloud is printed at 600dpi and is 85% thicker than a standard credit card. 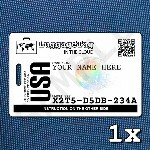 Personalized with a unique code on each tag, it is secured with a hologram applied to both sides. In addition, unlike luggage tags provided by airlines, LuggageTag in the Cloud and its clear vinyl loop are both durable, waterproof, mud-proof, snow and freeze-proof and can easily withstand extremely rough handling. In conclusion, LuggageTag in the Cloud is the right solution for traveling with peace of mind. The tag can be placed on a suitcase, carry-on bag, laptop case, backpack, handbag and much more, with the same protection every time. Aptika, a company with a 20-year history. We have been in the ID card business all that time and still ship to 89 countries. We sell all the equipment to manufacture ID cards and we are the developer of IDpack, a software solution for designing and printing ID cards. Aptika is your source for ID card and photo ID supplies and security equipment. Our warehousing facilities stock all ID solutions from ID card printers, signature pads and ID card software to ID card systems. Aptika, your best value for money! We have been assisting organizations to integrate ID card printers and electronic signature pads for their identification card needs since the year 2000.